Two days after Chinese President Xi Jinping made a keynote speech on China’s determination on further opening-up and reforms, he inspected the People’s Liberation Army Navy in the South China Sea. It was the largest parade ever since New China was founded in 1949. The navy displayed its latest equipment and best strength with unprecedented transparency. The parade sent out subtle messages to the outside world. China’s military is undergoing a deep transformation from land-based to more sea-based operational forces. The PLA Navy used to attach great importance to coastal defense; it has now put greater significance on missions in the deep blue sea. The navy used to be separated by its East, South and North Sea Fleets based on geographic areas. But now, it focuses more on integration and mission completion. The warships that took part in the naval parade represent PLA Navy’s latest achievements. They also reflect the changing concept of Chinese naval development. With the aircraft carrier starting to operate in battle groups, the navy has been transformed into the PLA’s main combat force, to meet challenges in the future. The rapid development of naval warships and high-tech weaponry indicated that China doesn’t feel secure in protecting its core interests at sea. There are territorial disputes in the South China Sea and the issue of Taiwan. The increasing tempo of US so-called freedom of navigation operations to China-controlled islands and reefs have frequently challenged China’s claims in the South China Sea. Some experts believe that future conflicts will very likely occur on the seas. 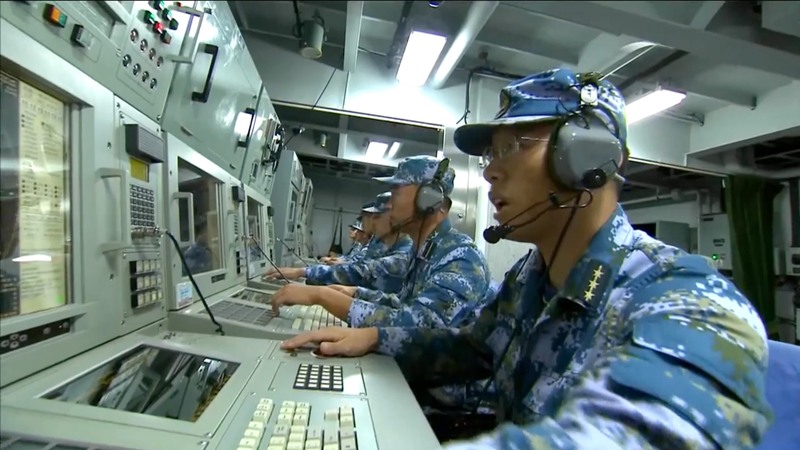 The PLA Navy is feeling the pressure and hopes to speed up modernization to achieve set goals. With the rising tensions at sea and China’s growing economic links to the sea, it’s a natural choice for the PLA Navy to pursue a path that will best serve the country’s interest. To many people, the aircraft carrier is the symbol of maritime power. It also plays a special role in the strategic approach to the Asia-Pacific region. The formation of a carrier group will bring about an ever-expanding number of frigates, destroyers, submarines and fighters to form carrier strike capabilities that will enable the Chinese navy to better protect its interests at sea. China’s first home-made carrier will soon go to sea trials and enter into military service. And more carriers are expected to be built in the future. The extensive blue-ocean training on the Liaoning has mainly solved the problems of how to use the concept of carrier operational groups. Now, the indigenously produced carriers are seen as a major step towards China’s long-term strategy to build a maritime power. 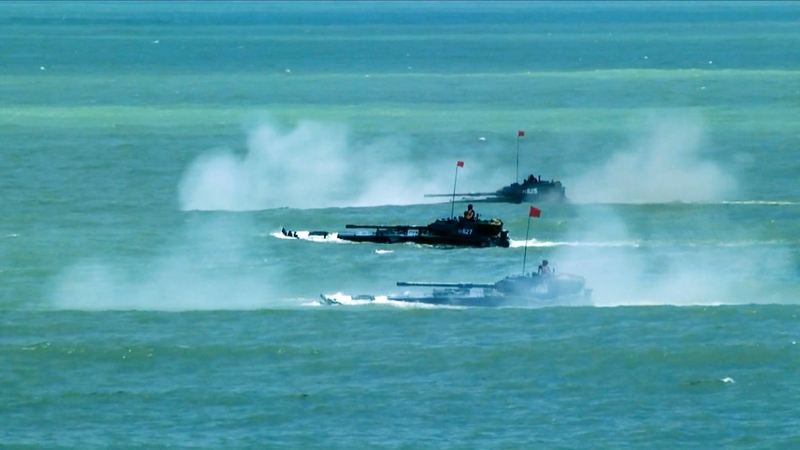 The parade took place when the PLA Navy was conducting the largest military drills in the South China Sea. The navy has commissioned more military drills to train its combat capabilities. Some are routine, while others will be drawn up based on security threats in the region. For example, the PLA Navy says it will conduct a live-fire drill in the waters of the Taiwan Strait, amid tensions over increased Taiwan independence movements. During the parade, President Xi Jinping told officers that “the mission of building a mighty navy has never been more urgent than it is today.” The PLA Navy can only strengthen training to boost its role. Chinese strategists believe that peace can only be safeguarded through strength. The stepping up of naval operational capabilities could reflect the change of thinking under Xi Jinping’s leadership. But the PLA Navy has not been engaged in any real military combat for more than half a century; it takes time to test its real capabilities. Xi Jinping has set a new target for the PLA Navy – to become a world-class force, through combat training, technological innovation, building a modern maritime combat system, and forming the ability to conduct diversified missions. It’s a big picture for the navy to grow, but also a huge challenge to fulfill its mission. Unlike some western powers that focus on interventions, the Chinese navy is shaping up to win an unpredictable sea war. Some military experts have pointed out that reforms in the navy should focus more on the change of mind instead of a change of equipment. The real victory is to derail the enemy’s intentions to launch a war. The real impact of PLA naval modernization is being closely watched.